What makes Live Lingua Spanish different? Here are just a few of the reasons to study with us at Live Lingua Spanish. 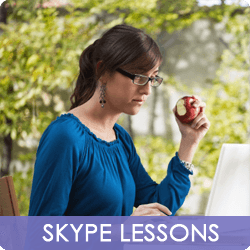 1-on-1 online Skype Spanish lessons any day of the week. Our Spanish teachers have a combined work experience of over 150 years. All of our Spanish tutors online can speak a second language. English, French and Italian. Skype tutors with certification and experience with DELE and ECELE exam preparation. Each Skype Spanish lesson lasts for 60 minutes. Total flexibility for Spanish classes. Enroll in as many or as few hours as you would like. 60 minute long free trial lessons! No cost for registration or hidden fees. This is all Live Lingua will ever charge you. Here is what some of our hundreds of students have said about their Spanish lessons online. "I am a Spanish teacher in the U.S. but I was not able to practice my Spanish with a native speaker, Live Lingua was the answer to my prayers, and it is very affordable!" "My work brought me to Mexico City and I did not speak any Spanish. I did not have time to spend hours in traffic everyday to get to a physical school and Live Lingua worked great for me. I have been with them for over 3 years and now speak Spanish very well." Take a 60 minute trial Skype Spanish lesson with one of our Skype Spanish teachers. No credit card required. Affordable private Spanish lessons for as little as $10.99 U.S. an hour. Price includes all material.